There are many things in life that seem ordinary—even dull—until you bother to take a closer look. Most people would agree that a freeway is nothing more than a featureless stretch of asphalt designed to put drivers to sleep. It might surprise them to learn that many of America’s highways were built with a secret function in mind. In times of war, these straight, broad, boring roads are meant to double as landing strips for airplanes. Likewise, thousands of people visit the observation deck of the Empire State Building and marvel at the city below, without ever realizing that the tower on top of the building was built to be a dock for enormous blimps known as zeppelins. Before the jet age began, zeppelins were thought to be a viable means of transporting passengers across the Atlantic. (That dream died one day in 1937 when a German zeppelin named the Hindenburg burst into flames over New Jersey.) 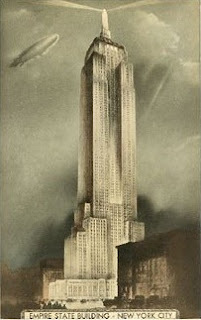 The Empire State Building, the tallest building in the world when it was finished in 1931, seemed an ideal landing port. However, strong winds made it far too dangerous for the skyscraper to serve its original function. Only one landing was ever successfully made--and it lasted a mere three minutes. Still, I can't help but imagine how fantastic it would it be to fly from Europe and arrive in America at the top of the Empire State Building. Heights really aren't my thing.